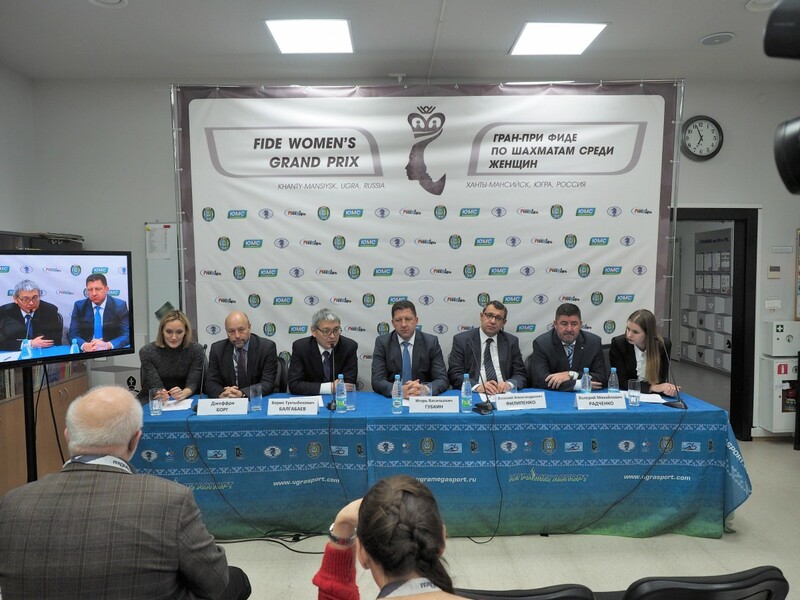 A press-conference dedicated to the start of the last event of the FIDE Women’s Grand Prix took place on November 18 at the press-center of the Ugra Chess Academy. 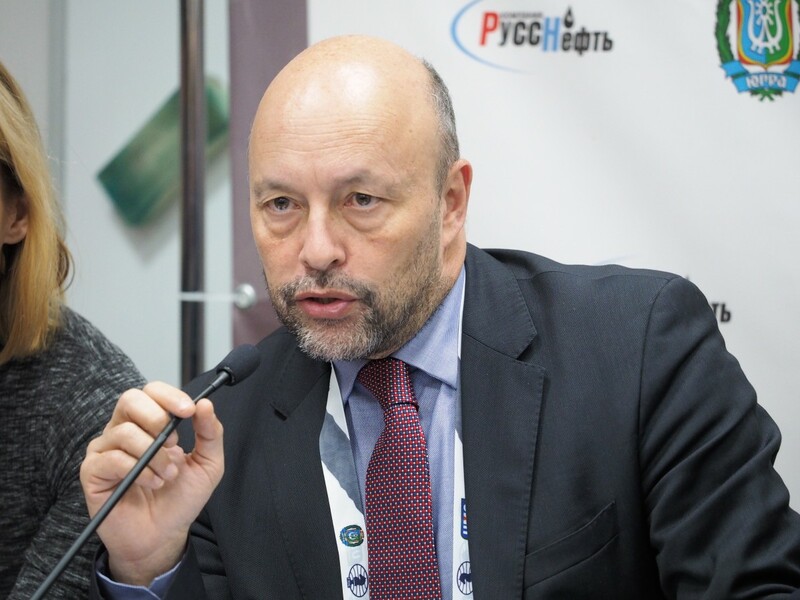 The speakers were CEO of FIDE Geoffrey Borg, Director of FIDE Moscow Office Berik Balgabaev, Director of Physical Culture and Sports Department of Ugra Igor Gubkin, President of Ugra Chess Federation Vasily Filipenko and the Executive Director of the event Valery Radchenko. – A question to Mr. Borg. FIDE Grand Prix is one of the key tournament series in the women’s chess calendar. Tell us please about its role in the women’s championship cycle. Do you have any plans of changing the formula? – We have discussed this issue at length with the current leader of the women’s chess, grandmaster Hou Yifan, who had stated that she will not participate in the Grand Prix events until the women’s championship cycle will be made similar to the men’s one. This particular tournament is very important for all participants, as the winner of the Grand Prix will get an opportunity to challenge the crown in a match against the World Champion. Four participants of the Khanty-Mansiysk tournament have chances to win the series, so I look forward to spectacular and exciting games. – A question to Mr. Balgabaev. Khanty-Mansiysk is famous for its high organizational standards. What can you say about the conditions at this tournament? What other major events will be given to Khanty-Mansiysk in the near future? 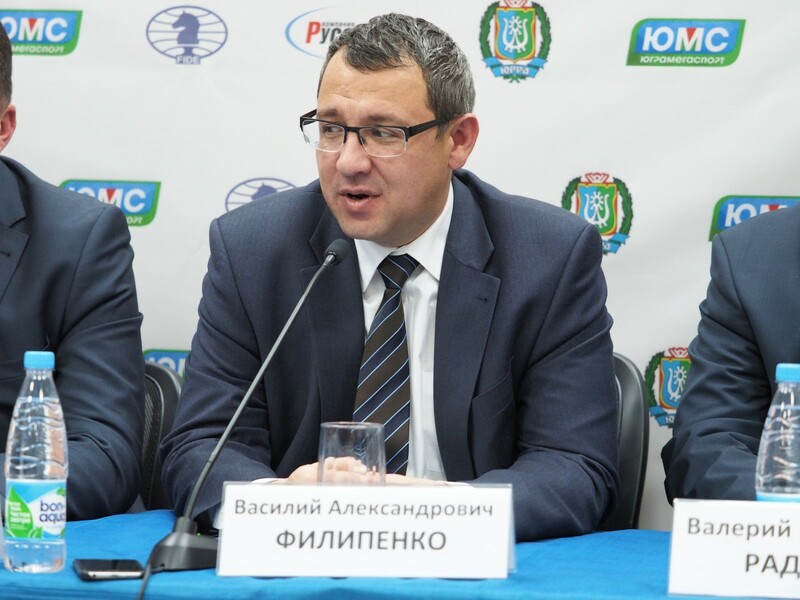 – As you know, FIDE and Khanty-Mansiysk organizers have strong bonds. Every year we organize at least one major event here. A couple of months ago Khanty-Mansiysk hosted the World Youth Championships, and now there is a Women’s Grand Prix event… Pretty soon, already in 2017, the capital of Ugra will be welcoming World Team Championships, both men’s and women’s. 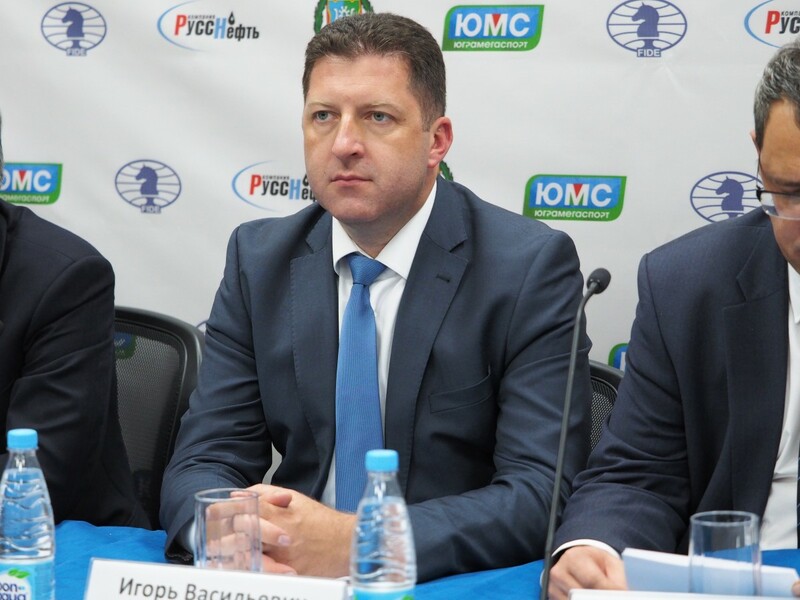 In 2018 Khanty-Mansiysk will host the Women’s World Championship in a knock-out format, in 2019 there will be the World Cup, and, finally, in 2020, a long-awaited Chess Olympiad will come. We just had a meeting with Natalia Komarova, Governor of Ugra, where we discussed details of the upcoming major events. I want to underscore that Khanty-Mansiysk has always been exceptionally hospitable, and I hope all participants of the Grand Prix tournament will be satisfied. – Igor Vassilyevich, how much attention is dedicated to chess compared to other sports popular in the region? – Chess is special for us, as it is listed among the most popular sports. About 85% of children in primary schools are taking chess classes. Together with FIDE we carry out major international competitions, and we deeply appreciate the trust FIDE puts in us. On our part, we are trying to keep the bar high and maintain an excellent level of organization. – There are many chess programs running, which we carry out together with the Ugra Government and local businessmen. And many more other interesting projects are yet to come to remove blank spots from Ugra chess map. We put together chess and computer classes in the most remote areas of the region and organize online lectures with Russian leading grandmasters. – The city has big sporting events every week, from sledge hockey to boxing, How did you manage to prepare for a chess event under such a tight schedule? Could it negatively affect the conditions? – Yesterday we concluded the Ugra Cup sledge-hockey tournament, and today we are welcoming chess stars. During the Grand Prix, Khanty-Mansiysk will also host a leg of the Russian Snowboarding Cup and two more big international competitions: Boxing World Cup among sportsmen from oil producing countries and International MMA tournament “The Commonwealth Cup”. 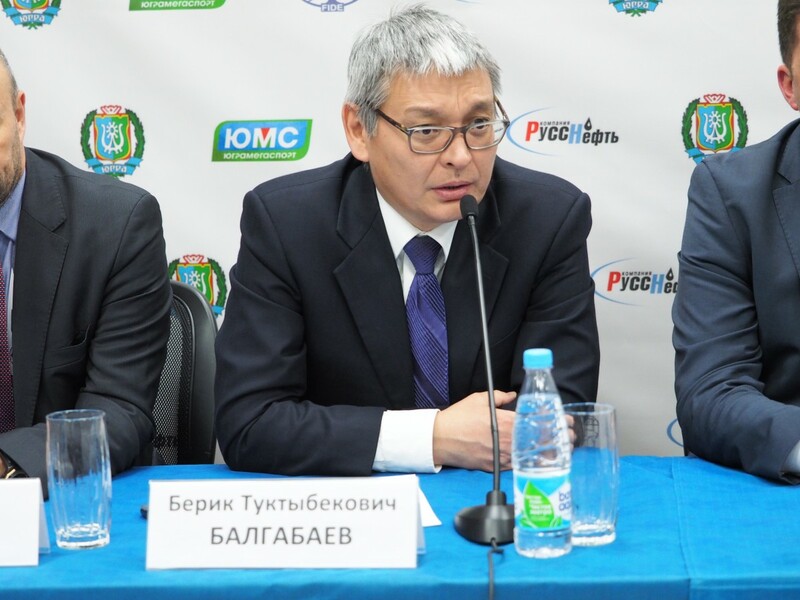 We consider all chess events to be a preparation to the 2020 Olympiad. We have vast organizational experience and since our preparation for all events starts well in advance, the players will hopefully like it here very much!